« Elgringo’s Retina Screen – thanks for the info. Yet again it is time for my annual Eye Hospital Appointment in London at the Western Eye Hospital Nr Paddington, London on Thursday 7th March 9.10am. I left home at 7.00am (Time to grab a coffee at the local shop mmmm) to catch the 7.30am train again to Paddington which takes about 1 hour so not too bad as it goes direct but also gets very busy, my appointment was 9.10am – yeah right (they always run late). Firstly I was seen by the nurse straight away to check my vision as normal and this has remained unchanged since last year which is good news, I still have big problems with night vision due to all the laser I have had in the past to help my retinopathy, I have also had two Vitrectomy Operations at the Western Eye Hospital going back a few years. I also have damage to my central vision in my right eye but it’s amazing how you cope. I was also given the drops to dilate my pupils which sting like hell for a few seconds but help the doctors see the back of your eyes easier. 20 minutes passed which gives the drops time to work and I was called by the photographer who takes images of the back of your eyes to check for any anomalies and also another machine which checks your macular condition again by a photograph. Another 45 minutes passed and I was called by the Eye Consultant (Yes panic setting in by now) but at least I was being seen really fast which was great. I sat down with the Consultant who looked at the images of my eyes and macular condition the n she had a good look at my eyes with a very bright light. There is quite a lot of scaring to the backs of my eyes where. I also have some sort of weird eyelid infection which has been there for ages so the consultant had a good push of that and decided I needed some SPECIAL cream but would probably need it cutting mmmm lovely. So the outcome of this check up was all good news as my eye site was stable with no changes since last year and my macular was in good condition which is such a huge relief and hard to explain what a constant worry it is. I know we already know this but it is so important to keep your regular Diabetes check ups just to make sure everything is in order, I am a prime example (I know show off) as it was Vision Express who originally spotted my eye issues going back probably 8 years in which they immediately contacted my local eye clinic – thanks to Vision Express and of course the Western Eye Hospital. 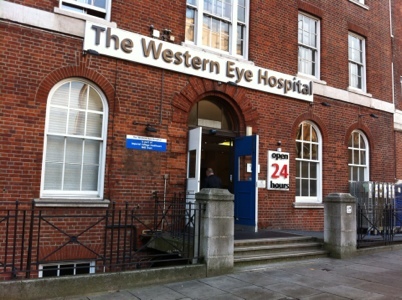 Sorry just one last thing – thanks to everyone at the Western Eye Hospital Nr London for looking after me so well.